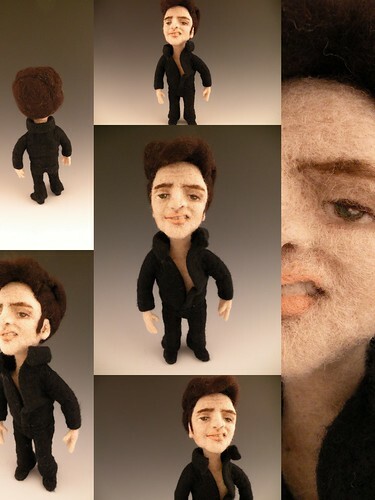 Li'l Elvis in needle felted wool, originally uploaded by feltalive. The wool practically sculpted itself - Li'l Elvis really wanted to come to life. This creation was a lot of fun - right down to the Elvis snarl. I'm just getting into Felting & I really enjoy looking at all your work! It's all such an inspiration! Thank You! Kay! He's fabulous! I've been waiting for him to show up and oh, just look at him, he's the coolest sexiest thing in felt. I'm not sure what you do with all the celebs you felt, but seeing them all together like a red carpet photo shoot would be the tops! that's wonderful! what a talent you have!